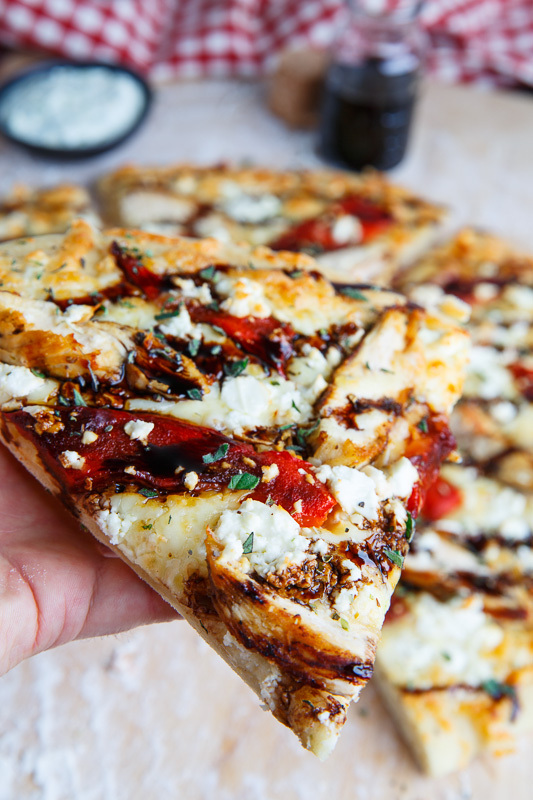 A Mediterranean themed pizza with marinated grilled chicken, sweet roasted red peppers, salty feta and a tart balsamic drizzle. 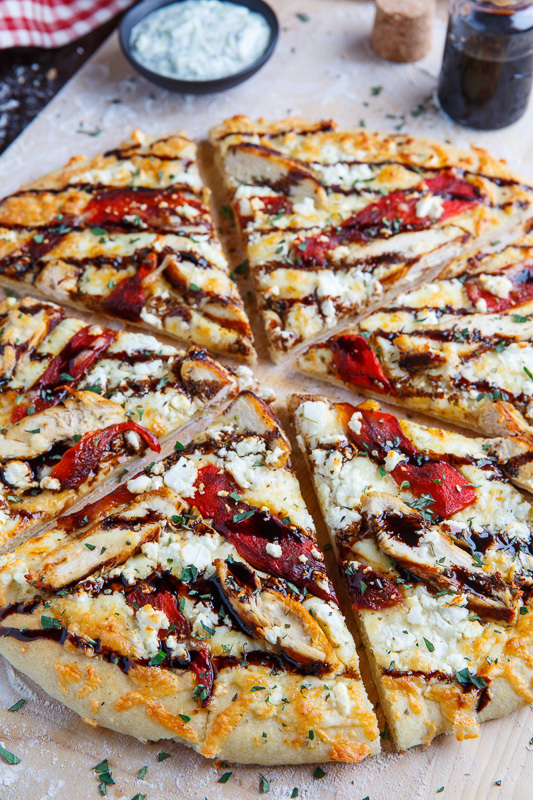 Up next we have a Mediterranean themed pizza with marinated grilled chicken, roasted red peppers, feta and a balsamic glaze! The chicken is marinated in a tasty mixture of olive oil, lemon juice, garlic and oregano before being grilled and sliced for the pizza, and I have to say that this chicken is so tasty that you could eat it as a main all by itself. 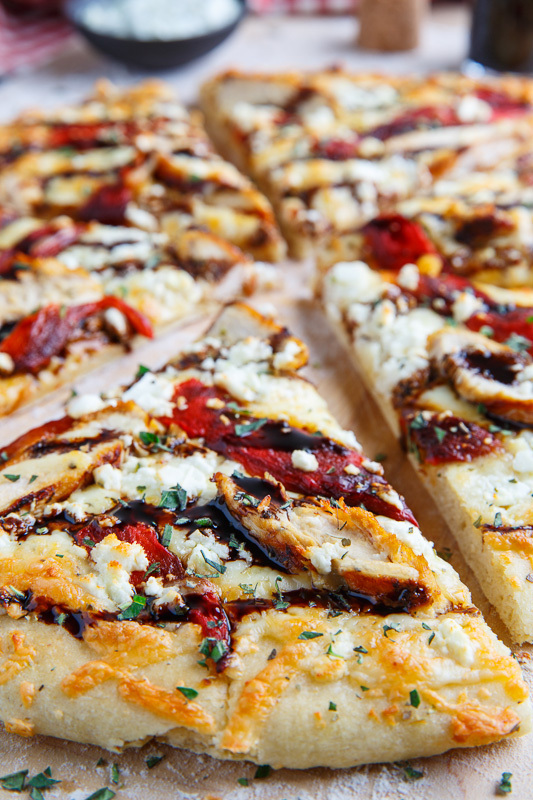 The flavour trio of the roasted red peppers, feta and balsamic glaze is the star of the show with it’s an amazing combination of sweet, salty and tart that will set your taste buds a fire with delight! 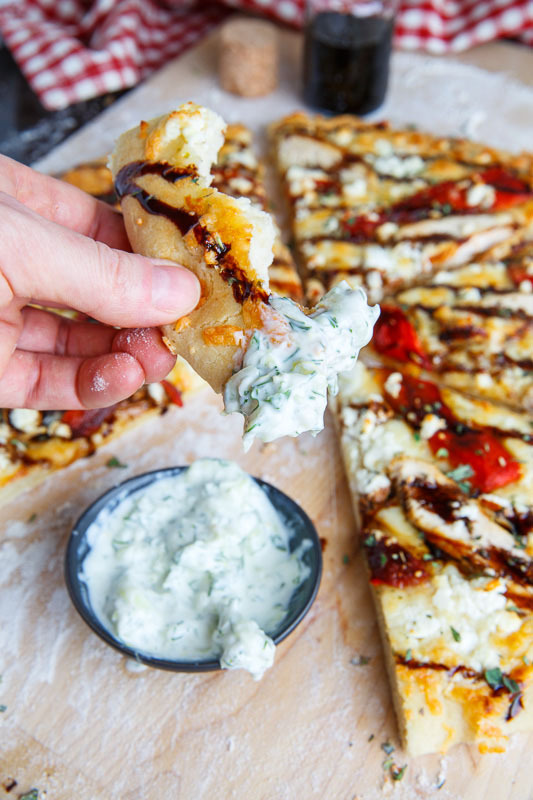 This pizza goes perfectly with a side of tzatziki and you can even dip the crust into it for those that like dipping their crusts! Mix all of the ingredients except the chicken, place in a sealed container along with the chicken and let marinate in the fridge for 30 minutes to overnight. Grill the chicken over medium-high heat until cooked, about 3-6 minutes per side, before setting aside to rest for 5 minutes and slicing. Bring the balsamic vinegar and brown sugar to a boil, reduce the heat and simmer until it has reduced by half and thickened, about 10-15 minutes. 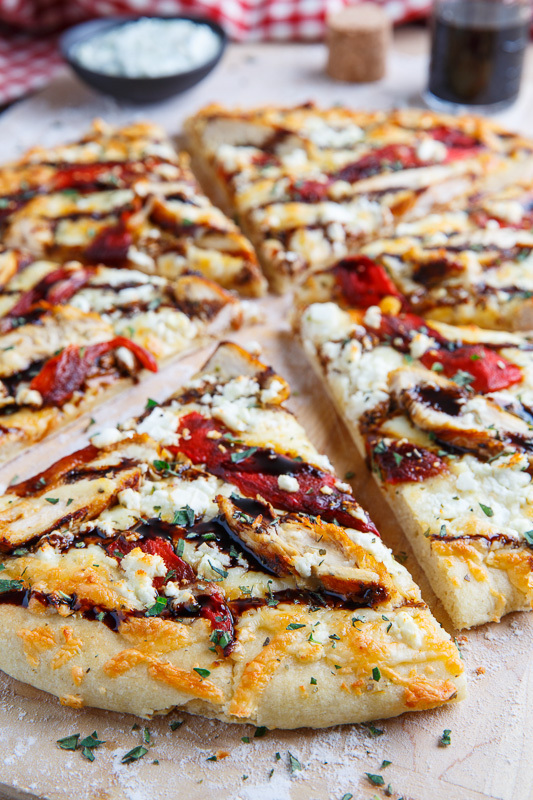 Shape the pizza dough into the desired form on a baking sheet, brush with the mixture of the olive oil, garlic and oregano, sprinkle on the cheeses, chicken and roasted red peppers. Bake in a preheated 500F/260C oven until the cheese has melted and the crust is crispy and golden brown, about 10-15 minutes. 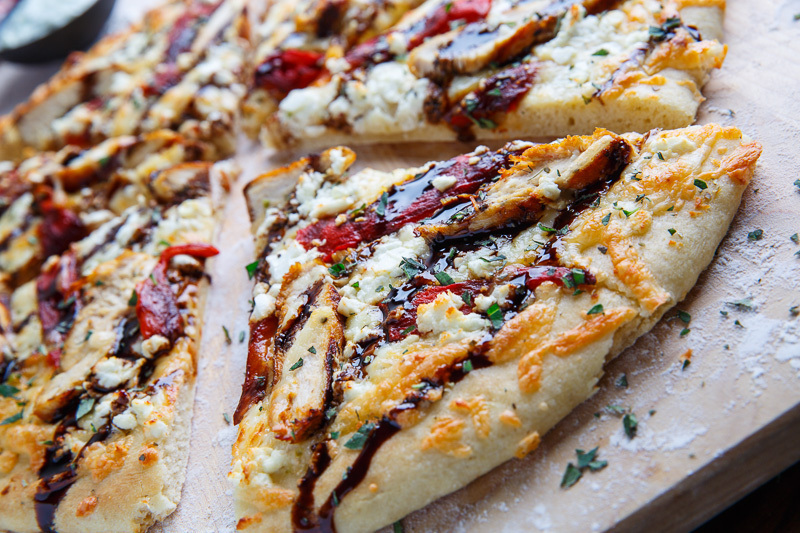 Drizzle the balsamic reduction on the pizza and enjoy! Option: Serve with tzatziki for dipping. Option: Add red pepper flakes for heat. Option: Add kalamata olives and/or red onions. Tip: Make a big batch of the balsamic reduction and store it in your fridge. What a delicious looking pizza! Wow, you're a prett good chef! Holy pizza facers, that's amazing. This was my first "home made" pizza entirely from scratch, dough and all, and it was fabulous!! Thank you so much for posting it. It was pretty much the tastiest thing I have ever made. Everybody loved it. It will become a regular at our house. M-E: I'm glad you enjoyed it!